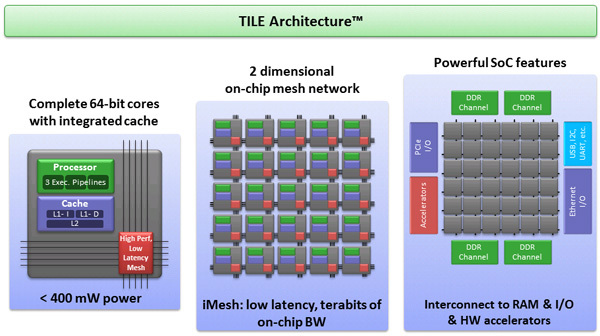 TILE-Gx is a multicore processor family by Tilera. It consists of a mesh network of up to 100 cores. It is to be produced by TSMC with 40 nm. It was announced on February 19, 2013 that Tilera would produce a 72-core Tile-Gx CPU capable of processing high-bandwidth networks. "Tilera Corporation Joins China's Wireless TD Forum as a Senior Member" (Press release). Tilera. 26 October 2009. Archived from the original on 26 July 2011. Retrieved 16 June 2011. ^ a b "Tilera preps many-cored Gx chips for March launch". 30 January 2012. Retrieved 21 February 2013. ^ "Tilera Goes After AMD, Intel With 100-core CPU". 26 October 2009. Retrieved 21 February 2013. ^ "TILE-Gx8009 datasheet" (PDF). Archived from the original (PDF) on 2013-02-01. ^ "TILE-Gx8016 datasheet" (PDF). Archived from the original (PDF) on 2013-02-26. ^ "TILE-Gx8036 datasheet" (PDF). Archived from the original (PDF) on 2013-03-22. ^ "TILE-Gx8072 datasheet" (PDF). Archived from the original (PDF) on 2013-08-16. ^ "Tilera's Breakthrough 100 Core TILE-Gx100 Processor Nominated for EE Times Ace Award" (Press release). 25 March 2011. Archived from the original on 24 April 2013. ^ a b c "TILE-Gx architecture shema". Archived from the original (JPG) on 2013-03-22. ^ "MIT's 100-core CPU Will Be Ready This Year". 24 January 2012. Retrieved 21 February 2013. This page was last edited on 22 July 2018, at 11:29 (UTC).